Play Slot Panther Moon in online casino! Panther Moon Slots is a simple game from Playtech; a video slot with 5 reels and 15 paylines that doesn't have all of the bells and whistles of some of their other games, but really focuses upon the slot play itself. There are no engaging bonus rounds built into this game, but there is a free spin option to help players increase their bankroll. Plus, a gamble function that allows players who have won to put it all on the line to double their money. 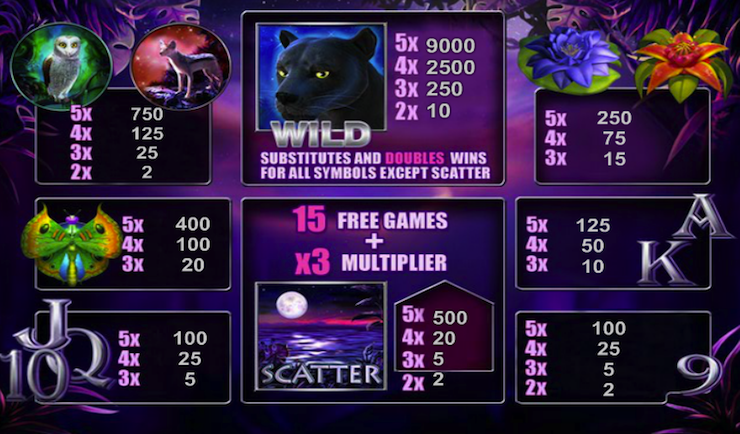 Panther Moon Slots has a jungle theme with symbols that include the namesake panther, a sunset, flowers, an owl, a butterfly and other things that are suited to the theme. The color-scheme doesn't quite fit since it is focused on purple and pinks, but it does add a sense of the exotic to the jungle game at the same time. Panther Moon Slots is an ideal game for players with a smaller bankroll because this is a game that does only take one coin at a time pre payline with the coin sizes ranging from $0.01 to $0.05. Players who play this game, regardless of their bankroll, have a chance of hitting the top jackpot regardless of their bet size.